Hlolwa seemed inspired. She scratched out the loose dirt from within the den and dragged the tires in front of it into new arrangements before coating them generously with her own urine. She caught her puppies one by one and gave them a thorough grooming. Mhumhi was more than a little taken aback when she wanted to do the same to him. He was to uncomfortable to protest or to acquiesce, so he just stood there. Hlolwa seemed to take his silence for agreement and began grooming him at once, bracing herself on his shoulder to reach the tops of his ears. Mhumhi got stiff, but still wasn’t sure what he should do about it. Hlolwa’s tongue moved in a brisk and efficient way, separating the strands that had been crusted together. At the same time she bore him down with her greater weight until he was on his side, so she could thrust herself between his forelegs and get at his chest. Tareq, Vimbo, and all five puppies stood in as an audience for all of this. The former seemed cross, the latter wide-eyed, and Vimbo- well, Mhumhi wasn’t sure, but he thought Vimbo might have been amused. Once Mhumhi had been thoroughly groomed, Hlolwa let him up and went back to her rearranging. Mhumhi shook himself and glanced at the sun. “They will be able to find it on their own, yes, but that is why you’re going to take them here,” said Hlolwa. Mhumhi gave her a blank look. She whisked her tail. Mhumhi obeyed her, but gave her a wide berth as he circled around to get the puppies. There seemed to be an almost frantic light in her eyes. She was looking at Vimbo. Mhumhi almost thought she was about to groom him too. Mhumhi had a puppy in his mouth at that moment, so he was unable to reply, and by the time he’d tumbled the little fellow back into the den Hlolwa had moved off, tail switching from side to side as she sniffed the ground. “What’s going on?” asked Tareq, rubbing one of his eyes. Hlolwa hadn’t so much as glanced at him; it was Mhumhi, as usual, who had cleaned up his nightly mess that morning. 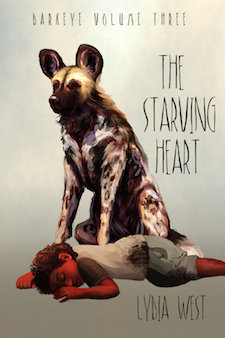 It wasn’t an easy job- Tareq made a bit more than an average puppy, and Mhumhi could never get all of it up. He bore a stale kind of stench, and his temper had gone back towards crabbiness. Mhumhi hoped his leg would heal quickly. “Some dogs are coming over to meet you and the puppies,” he told him. “I dunno,” said Tareq, and he turned his head to the side and lapsed back into sulky silence. Mhumhi couldn’t say he didn’t share the sentiment. Later, when he’d gotten Vimbo situated atop the tires- ignoring his looks of confusion- Hlolwa gave him a few more tidying licks and told him to go meet the gray pack. “I don’t know where they’ll be coming from, though,” Mhumhi pointed out. She said this as if it were the most obvious thing in the world. Well, it was the most intuitive, certainly, but she didn’t have to patronize him, Mhumhi thought to himself, as he plodded through the garbage. He was beginning to feel a little bit like a lackey. That feeling didn’t go away when he saw the gray pack. There were at least ten of them, all spread out in a line, sniffing. When one of them spotted him, she gave a loud yap that brought all the others to attention. Mhumhi bore their collective gazes and stifled a sigh. They did seem a bit surprised, so maybe Hlolwa was on to something. There were certainly a lot of them- as the first row advanced towards Mhumhi, more emerged from behind the hills. He saw the unpleasant-looking golden jackal from the night before, and beside him, Kutta. Telipa trotted out of the mass to greet him, her brushy little tail wagging. Mhumhi made a noncommittal sound. The footsteps of the gray dogs amassing behind him were taking up most of his attention. When they reached the tire stacks, Telipa’s pointed ears pricked up, the fur on her back rising slightly. Mhumhi was somewhat surprised himself. He had not grasped Hlolwa’s vision before, but now, facing it, he understood. The tires on the ground curved inwards like a trail, and they were all saturated in her scent; a confident scent. The stacks were tall and black and foreboding, looking almost like the buildings they had all left behind. Atop them prowled the hulking silhouette of Vimbo. Hlolwa herself was resting at the entrance to the den, her forepaws crossed, her eyes hooded. It was as though she had forgotten that she was in a garbage dump, and was back in her own garden, full of the thick scent of life and rot. A Madame once more. Telipa panted a little and licked her lips. A sense of anxiety passed through the group behind her. Hlolwa’s eyes flicked to Mhumhi. There was movement within the gray pack, but not much of it forwards. Finally from the mass of them came Kutta, stalking more than walking, her tail raised and bristling. She flashed a look at Mhumhi. He kept his chest out and ignored her. The gray dogs slowly approached Hlolwa, clumping together in a huddle to fit between the rows of tires, noses working. Mhumhi let them pass and then stayed behind him at another look from Hlolwa. He was beginning to feel a bit of her pleasure in all this himself; prowling back and forth with his tail raised, as though he were trapping them inside. From the way they kept glancing backwards he was succeeding at making them uncomfortable. As the gray pack approached, Hlolwa slowly raised her head. They all stopped as though they’d been ordered. Hlolwa said nothing, her eyes still half-lidded. Above her, Vimbo gave a giggle that made most of them start. Her tone was thick and poisonous. Telipa swallowed twice before she responded. She rose and stepped to one side. Almost at once the puppies scrambled up out of the den, their stub tails raised and waving. Mhumhi had to stifle a laugh at the sight. Hlolwa’s front half had been calm and dignified, but her back half, inside the den, must have been under a constant assault. The sight of the puppies certainly had an effect on the crowd. All around Mhumhi, gray tails started wagging. Telipa whined, lowering herself down on her forelegs, tail whipping furiously as the puppies came towards her. Hlolwa allowed her to sniff them and try to lick them a few times, but they were shying away after their initial friendliness, stumbling back over towards their mother. Telipa’s tail drooped. “They- they’re more active than I thought,” she said. Hlolwa glanced back at Mhumhi, who was taller than everyone in front of him. “If that’s what you see,” said Hlolwa. The silence dragged for a moment. “I adore propositions,” said Hlolwa. Hlolwa’s hooded eyes conveyed nothing but sheer contempt. Telipa scuffed the dirt with her paw. “And your proposition?” asked Hlolwa, tilting her head ever so slightly. Dead silence. The gray pack was straining forward, listening for Hlolwa’s response. Mhumhi was stunned. He looked at Kutta, but her expression was impassive. “They would be treated like our own,” said Telipa, raising her muzzle. Mhumhi realized with a little start that there was a certain thickness about her abdomen. Hlolwa must have noticed to, for her lip curled slightly back. At once there came growls from within the gray pack. Telipa silence them with a sharp lash of her tail. This elicited enough raised hackles to make even Mhumhi nervous. He wondered if Hlolwa wasn’t getting too proud. “I have one more question for you, if you’ll permit it,” said Hlolwa, in a manner that suggested she needed no one’s permission. “Ask,” said Telipa, who’s tail looked like a bottle-brush. She turned her muzzle to the left, where Tareq was lying in an alcove, all but forgotten. His face went pale at Hlolwa’s words, for everyone was suddenly looking at him. The voice was not Telipa’s. Hlolwa stepped forward. She didn’t look at Mhumhi, but he felt her fury. There were low murmurs of assent from the crowd. “If it talks, it’s a dog,” the gray pack intoned, startling Mhumhi. Hlolwa interrupted her with a loud laugh. “That’s not true,” snapped Kutta. “Stop,” said Kutta, but Hlolwa went on, almost gently. No one said anything, though Tareq gave a kind of muffled moan and covered his eyes. A shiver seemed to pass through the crowd. Mhumhi, looking over them, suddenly realized something: though in the center they were all intermingled, near the edges there were groups solidly composed of one species: golden jackal, black-backed jackal, side-striped jackal, and coyote. Telipa was trembling, her fur raised, her golden eyes wide. “How d-d-dare you,” she said, stuttering with anger. “Did you know that coyote by any chance?” Hlolwa asked, tilting her head. Mhumhi was already worming his way forward through the crowd, so that when Telipa sprang at Hlolwa he managed to intercept her, shoving her down with his shoulder. She sprang up, snapping and snarling, drool flying from her mouth. He countered her teeth with his own and caught her around the muzzle, rumbling at her as she struggled. His rumble changed to a surprised scream as a sudden stabbing pain flared in his bad leg. Kutta had bitten him there. He dropped Telipa’s muzzle as she let go, blood on her lips. He was unable to move, or do anything. Kutta’s eyes were flat and cold. Telipa shook herself, stumbling, and then snapped at his shoulder. When he turned to fend her off Kutta bit him on the back of the neck. It was not a warning bite. It was not anything like that. Her teeth stabbed through his skin and a red rage burst through him. Why? Why? He shook her off and went at her with a thunderous growl. They reared, their teeth clashing, forepaws clawing; this was no sibling’s quarrel, there was blood being drawn, Mhumhi’s blood, Kutta’s blood. Telipa darted to bite him on his bad leg and Mhumhi fell back with a yelp. The gray pack was howling and yapping, their eyes shining from the blood, pressing forwards; Hlolwa was hunkering low over top of her puppies. Tareq was shouting indistinct words, tears in his voice, but Mhumhi couldn’t make them out. He was on his back, struggling, as Kutta’s teeth closed around his neck. She caught the fur that Hlolwa had so recently cleaned, but nothing more. Mhumhi kicked her in the stomach and got to his feet. They both stood tersely for a moment, then Kutta said something, her lips curling back, her tongue red. A sudden fury like he’d never felt flashed through Mhumhi and before he could think he flung himself at her and bit down hard on her muzzle, forcing her mouth shut, so that she squealed with surprise. Telipa sprang to attack his neck from the side but he shrugged her off like so much water and twisted Kutta down onto the ground. Telipa jumped at him again, whiskers bristling away from her sharp little teeth, and caught his bad leg. The pain jolted through his brain, and he spun around and caught her by the back of her neck in his jaws, and he kept closing them, and he kept closing them, and he could almost bite through bone, and he had seen Vimbo bite through bone, and he knew that sound, and he heard that sound, and he knew it was all over, then, when he heard that sound. Kutta was still on her side, but her eyes were no longer furious: they were afraid. They were all afraid, the gray pack, everyone. Afraid of him as he stood there panting with Telipa’s blood on his tongue. With a loud thump and a squeal Vimbo barreled down towards them, all of his heavy, menacing bulk, and they gray pack scattered- simply scattered, like papers swirling in the wind, leaping over the tires, bolting in all directions. Kutta was left, and she got to her feet. Her muzzle was bleeding, fresh wounds over scars. She stared at Mhumhi, and he stared back at her. Vimbo thrust himself between them with a loud, frightened giggle, his teeth bared and his head down between his forelegs. When he moved back again, Kutta wasn’t there anymore; Mhumhi just caught sight of her hindquarters fleeing over the top of a distant hill. One of the puppies whined in the new, emptier air, and Hlolwa licked his head. Vimbo whimpered, turning his black eyes onto Mhumhi. Mhumhi’s heart was pounding, and he looked at Telipa’s body. Something surged in him again, and he whirled to look at Hlolwa. “You provoked that fight!” he snarled. She stopped licking her son’s head and looked at him. They both looked at the corpse. Her puppies, calmer in the new silence, turned their heads upwards and began to nurse. Hlolwa is PEERLESS! DAMN but she’s good. I actually wish she had a better foil – Mhumhi, much though we love him, is nowhere near assertive or clever enough. Maybe he’ll get there someday, but certainly not right now. “Mhumhi let them pass and then stayed behind him” behind them? stayed behind? who’s him? “The voice was not Telipa’s. Hlolwa stepped forward.” Kutta stepped forward? Damn, Mhumhi… anger management issues much?